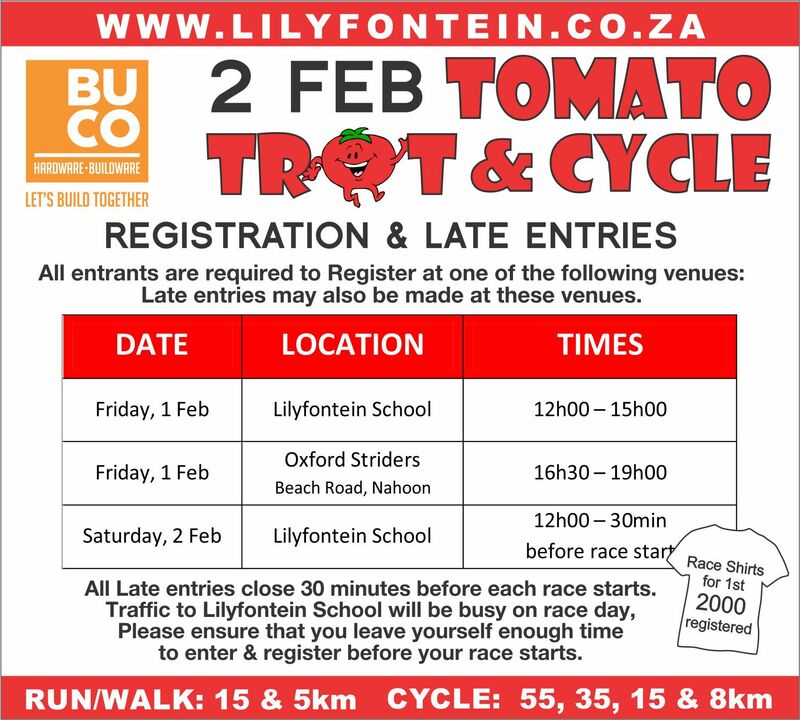 We are ready to host the Lilyfontein BUCO Tomato Trot and Cycle. Thank you to all the staff, parents and a special thank you to the PTA for all their passion and involvement to host such a massive event. We look forward to hosting the city of East London and surrounds on the day. Please take note of the following. Please take note that school will close at 12:10pm on Friday, 1 February 2019. This is to accommodate the registration and preparations for our Tomato Trot on Saturday, 2 February 2019. Thank you for your understanding. Mr Alan Angelbeck will retire from teaching on Friday, 1 February 2019. We would like to take this opportunity to thank Mr Angelbeck for his many years of service to Lilyfontein and especially in his field of teaching Mathematics in our High School. We wish him every of the very best for his retirement. We would like to welcome Miss Rebecca Horne to our staff and the Lilyfontein Family. Miss Horne will be teaching Mathematics in our High School and we wish her a long and happy stay with us. Mrs Moss is on maternity leave and we would like to welcome Mr Basil Birch who will be teaching in her place whilst she is on maternity leave. Please read through the letter to familiarise yourself with our Safety & Security policy. We have sold nearly 500 discs. If you do not have a one yet please get your R50 security discs from reception. We are hoping all vehicles will have a disc by the 4th February. 1. A reminder to parents that school will close early on Friday due to Tomato Trot Registrations. 2. We are expecting a great turnout for this event. Thank you to everyone for your positive contribution. 3. Volunteers please ensure you are on time and report to your manager. 4. All Lilyfontein families that have entered the TROT must register on Friday to collect race pack and shirt. 5. If you still want to enter please do so on Friday or Saturday at registration. 6. T.shirts are issued on a first come first served basis and only issued at registration. Come and enjoy the day with us, there is plenty to see and do. 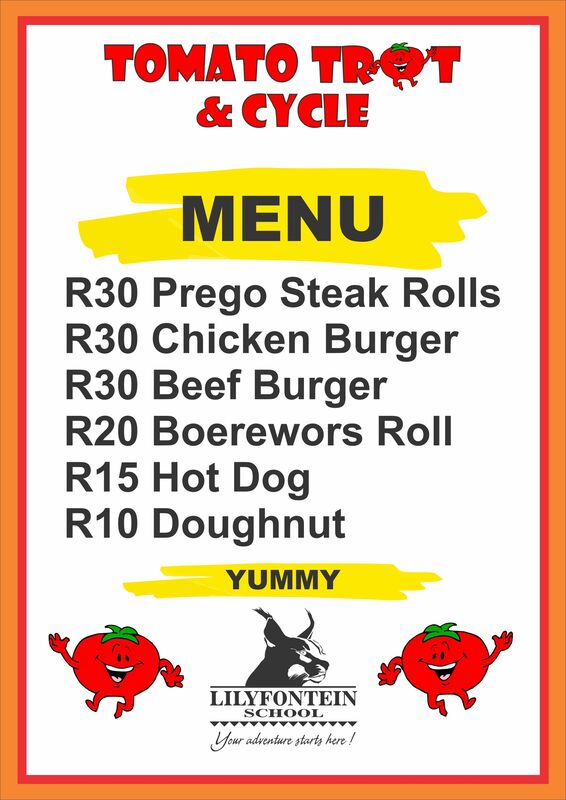 Please note that the PTA will be selling ticket booklets for the food tent at Registration Friday at Lilyfontein between 12-3pm. Buy your booklets early to get your delicious meals. Please note that these tickets are only for the beer and food tent and not redeemable at Lilybites tuckshop. Booklets are valued at R50 each. Please take note of the registration details for the TROT. Detail below. Every participant has to register to collect race pack. Thank you to all those that have assisted the committee in the organisation of the BUCO TOMATO TROT & CYCLE t we truly value and appreciate your help. Together we are stronger and this year is proving to be very busy and very productive. 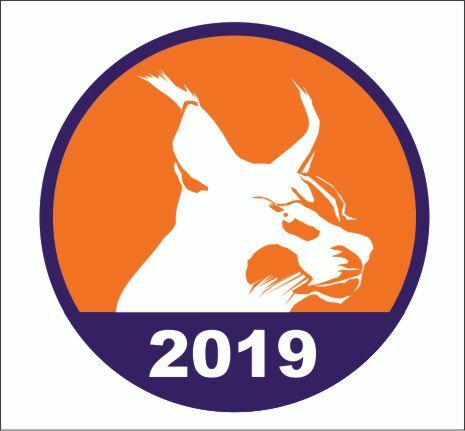 Lilybites would like to welcome everyone back to school for a fantastic 2019. 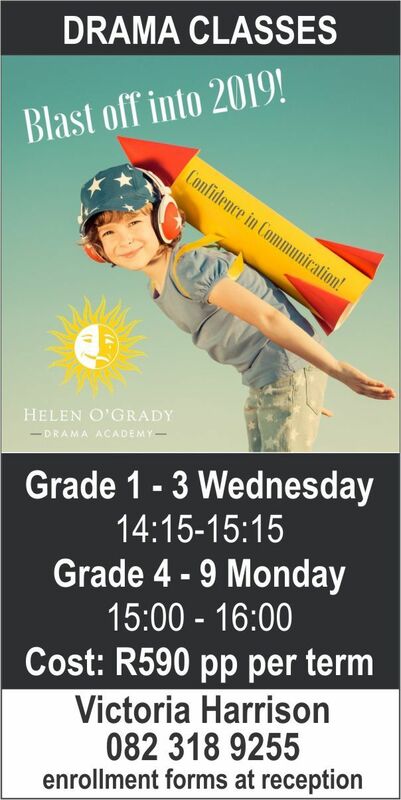 Please click on link below to see what we have on offer for the learners and staff. Tuck-shop accounts are available on request. 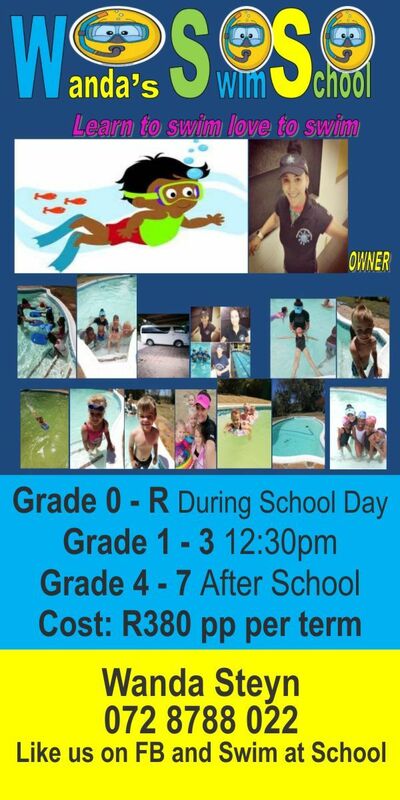 Contact Amelia Steyn for more information. Applications need to be early in the new year. Forms are available from the front office and must include a Scholastic Assessment not older than 3 years. Please note learners need to re-apply for each phase. Congratulations to Teo Bosazza and Ej Mollentze for being selected to go to Cape Town for the National XCO MTBike competition as part of the Eastern Cape MTB team. We wish them all the best of luck. - 1st Cricket vs Hudson Park 1st Algie Cup. Hudson Park won by 143 runs. - U13A vs Gonubie U13A. Gonubie won by 6 wickets. Chad Henderson 76 and 2/16 off 4 overs. Hudson Park won by 89 runs. - U10A vs Selborne U10A. Selborne won by 4 wickets. Corbin Tidbury 27, Jack Bosazza 2/10 off 4 overs. - 1st Team Cricket played against Grens at Lilyfontein. Lilyfontein -152/8 and Grens made 91/8. Lilyfonrtein won by 61 runs. Well done to Nathan Summers who made 44 runs and Logan McQuirk 36. - U19 Girls Cricket team played their first match against Hudson Park High School. Lilyfontein won by 100 runs. Well done to Megan Emslie who managed to score 47 runs and took 5 wickets. - U15 Boys Cricket played against Greenpoint. Lilyfontein made 177/7 and Greenpoint 81/6. Lilyfontein won by 96 runs. Well done to Tiaan Potgieter 55* and Luke Summer taking 2/15. - U13 Boys Cricket played against Hudson Park Primary School. Lilyfontein lost by 54 runs. Well done to Aya mkhokeli for taking 3/20 and Chad Henderson for making 31 runs. - U15 Boys Tennis played against Stirling and lost 0-6. - U13 Boys Tennis played against Gonubie and won 4-2. - U11 Boys Tennis played against Komga and unfortunately lost the match 2-4. ADVERTISING OPPORTUNITIES: Get your brand or business seen! Click on the links below to see what is on offer at Lilyfontein. With this talk, Dr. Nick Fuhrman encourages us to recognize the profound personal impact that we can have on others — both in and out of the classroom. Dr. Nick Fuhrman is an associate professor of environmental education in the Department of Agricultural Leadership, Education, and Communication. Also known as “Ranger Nick,” he teaches graduate courses in educational program development and data analysis and undergraduate courses in environmental education and teaching methods. Dr. Fuhrman received his bachelor’s and master’s degrees in Forestry from Virginia Tech and his PhD in Agricultural Education and Communication from the University of Florida. His life’s passion is teaching, and he often uses live animals (such as snakes, turtles, and owls) in the classroom and on his monthly television series, Ranger Nick. Dr. Fuhrman and his wife, Jessica, have a son, Miles, who already seems to love animals and the outdoors as much as his dad. Aiden Young, Grade 11V, took part in the Pacers 10km Road Race, on Saturday, 13th April, and came in placed 2nd Junior in a time of 40min 35sec. Please note that the wearing of gumguards is compulsory for all rugby and hockey players. Players without a gumguard will not be allowed onto the field of play. A massive thank you to all the Lilyfontein coaches, parents and sponsors that contributed to the success of the recent Southern Cape Sports Tournament from 17-22 March in George. We as the Sports Department, acknowledge the commitment from coaches and parents and are truly grateful. We also are very appreciative of the generous sponsorship from local businesses and parents. Your continued support is appreciated. The girls played 8 games against some very tough opposition. They won 1 out of the 8 games. Valuable lessons and fitness was gained. Please find attached the fixtures for the Rugby, Netball and Hockey games to be played in George. Please note that the times have been issued by the event organizers and are subject to change at their discretion. Congratulations to Nathan Lentz who has qualified in the Eastern Division fish-offs held between Southern Cape, Eastern Province and Border to represent the Eastern Division Junior Bass Angling Team for a 4th consecutive season. Nathan was part of the team which made history by taking top honours at the 2017 championship and then amazingly repeating this feat on the Vaal River Championship in 2018. This was truly a remarkable achievement in Eastern Division Bass Angling history. The team will compete in the South African Junior National Championships to be held on Witbank Dam in Mpumalanga from 28 to 31 March 2019.The team will travel home on 1 April. All the best for the tournament. - 1st part bred welsh show hunter - Champion part bred welsh show hunter - Supreme ridden welsh show pony Congratulations to Kara on a superb performance. Aiden Young (Grade 11) ran the Buffs Half Marathon, 21km on 10 March 2019 and was placed 2nd junior in a time of 1.31.32. This came with R10 000 cash prize as well as other prizes. We are super proud of our team on their excellent performance. Well done to the long hours of training and the dedication. Congratulations to all the Lilyfontein families for supporting and participating in the KOMGA Cabbage Patch, special mention to the following athletes that achieved podium finishes. A massive congratulations to Megan Emslie in grade 8, on winning a silver medal for finishing second in the girls’ U14 100m, in a personal best time of 12:91, at the Eastern Cape Athletics Championships which was held in Nelson Mandela Bay over the weekend. We are extremely proud of her! St Johns 43 all out. Heath v/d Merwe 5/1. Lilyfontein lost by 3 runs. Lilyfontein lost by 6 wickets.